The theme for this month is “Anything Goes” so I am using one of the new “Scruffy Little Cat” stamps that I bought from the Crafters’ Companion sale. The stamp is Ashleigh, I love her fur trimmed coat. 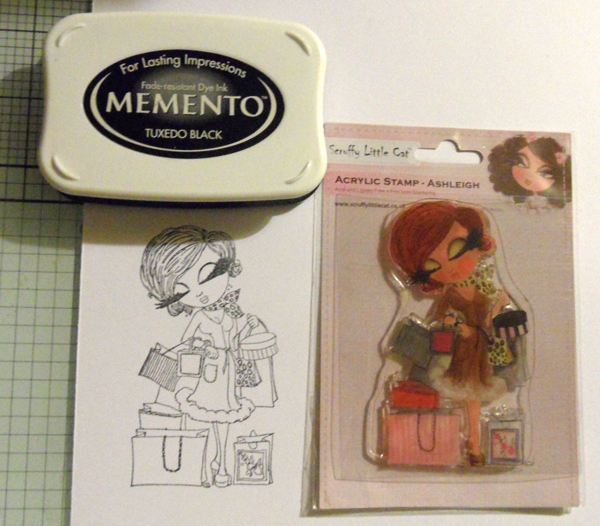 I stamped her onto Neenah cardstock in Tuxedo Black Memento ink (my standards for alcohol pen colouring). I usually start with colouring in skin, and so that is what I did here. I put down my lightest colour, FS4, then added shadows in FS7, then blended them with FS6. I tend to build up my colours quite slowly and go over and over a few times until I am happy. I am very pleased with my Spectrum Noirs and particularly like the great range of skin tones available. Next I added a bit of FS9 under her hair as I wanted it just a bit darker there. I also coloured her hands and legs in the flesh colours. 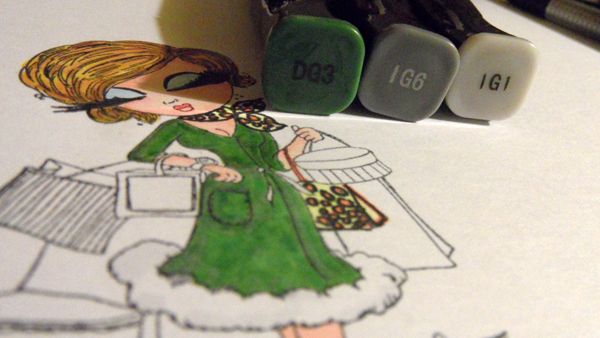 Then I added a small amount of PP1 to put some colour in her cheeks. 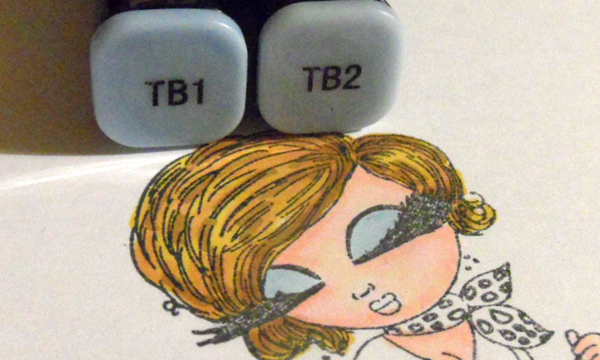 I decided she was going to have soft blue eye shadow and used the lovely TB1 and TB2 for this. 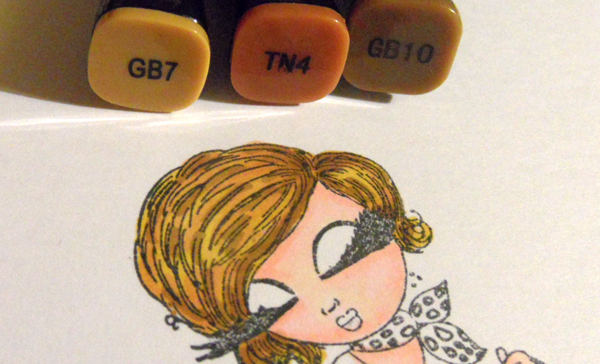 I coloured her hair in GB7, TN 4 and GB10, a combination I have used a few times before and rather like. I didn’t colour this in the “normal” way but just did lots of little lines in each of the colours to give a more speckly sort of look. I was aiming for the look of hair that has had dyed tips and highlights. Next I went over her massive eyelashes with the black pen then used PP3 on her lips. I touched the lower lip with the colourless blender pen to remove some of the pigment and give it a sort of sheen affect. Then I coloured her scarf and one of her bags in CT1 wth OR3 spots on it. Sort of a leopard skin effect. I then used the IG1 pen to pop a bit of shadow and dimension on the fluffy trim. You can’t really see this in the photo, but it does make a bit of difference in real life. I then used assorted Spectrum Noir markers to colours the various bags and boxes. I won’t list all the colours for this as I used quite a lot. You will notice that in some of the pictures she has a bright pink large bag, but in others it is a more muted red shade. I decided that the pink was just too loud and went over it with a coral red after taking some of the shots. I used the colourless blender pen to make the pale spots on the small pink bag and the highlights on her leather shoes. 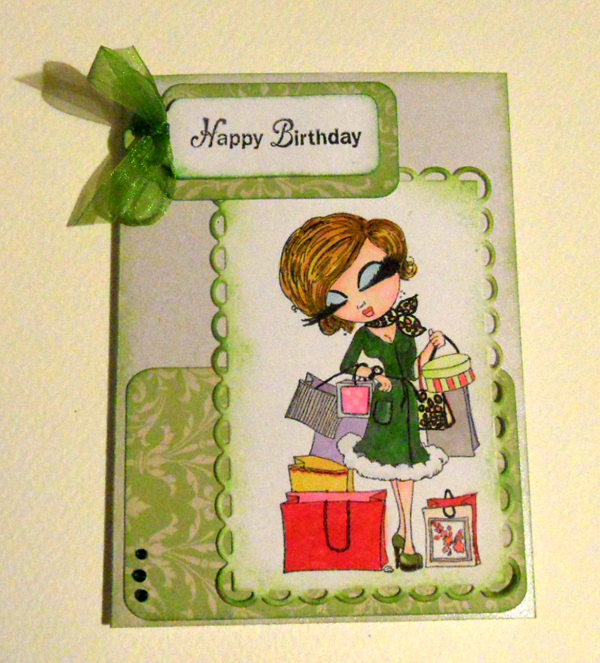 I finished the card by cutting Ashleigh out with an edge die and using Peeled Paint distress ink around the edges. I cut a panel and a tag in the same paper, along with a smaller white tag, which I stamped with my greeting. I then applied the distress ink to those too, as well as around the edge of my card base. 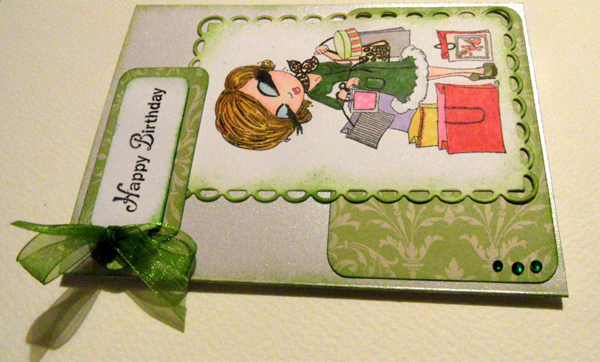 This was made from 300gsm Centura Pearl, which I really love for cards. Finally I punched a hole in the tag and tied some pretty green ribbon in.. then added three tiny green gems – well, a girl has to have her bling! ← Clean and Simple Card Making 4 – Learning a lot!